and training, but the journey is always enjoyable. corporate collections throughout the United States. programs and resources to enhance the quality, as well as, the publics knowledge and appreciation of their work. Through this program she had the honor of working with Mr.
Jonas mentoring her on the technical aspects of her work. In September of 2008, she was selected as a finalist in the Portrait Brokers of America, Inc., portfolio competition. offered in Georgia, West Virginia, and Pennsylvania. Demonstrations are scheduled several times a year at public and private venues nationally. 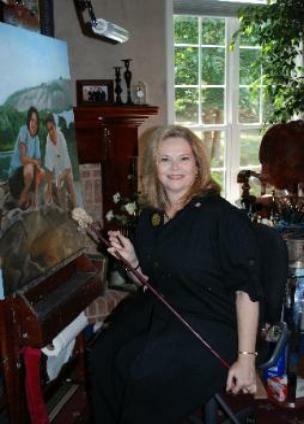 Painting has always been a passion in her life, however her love of friends and family nourishes her soul. She enjoys cooking and reading with a particular interest in art history. Deborah and her husband, Mark have raised two sons and currently live in the Metro Atlanta area. Copyright 2006, Artworks, scans, and web design Deborah Ankrom Kepes.